Ralph David Abernathy (1926-1990) A close associate of Martin Luther King Jr., Abernathy was a key activist in the Montgomery Bus Boycott of 1955-1956, which began when Rosa Parks refused to yield to a city ordinance segregating public transportation. After King´s assassination in 1968, Abernanthy became leader of the Southern Christian Leadership Conference (SCLC) and carried on the fight for racial equality. 1001 PEOPLE – WHO MADE AMERIKA who´s who of the Personalities, past and present, who have made America what it is today. This is a book recommendation by Gernot-M. Steifensand in Germany / Bavaria / Wendelstein. 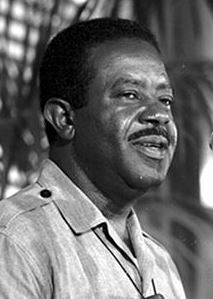 Ralph David Abernathy (* 11. März 1926 in Linden, Alabama; † 17. April 1990 in Atlanta, Georgia) war ein US-amerikanischer Bürgerrechtler sowie baptistischer Geistlicher. Ab 1955 nahm er, bald als enger Freund von Martin Luther King, jr., an der Bürgerrechtsbewegung zur Gleichberechtigung von Afroamerikanern (Civil rights movement) teil. Von 1968 bis 1977 war er Präsident der Southern Christian Leadership Conference. Seit 1971 arbeitete er in der Christlichen Friedenskonferenz (CFK) mit.